John Malcolm Thorpe Fleming Churchill—known as “Jack Churchill” to his friends, and later “Mad Jack” or “Fighting Jack”—was a professional soldier, son of an old Oxfordshire family. Born in Hong Kong, Churchill graduated from the Royal Military Academy at Sandhurst in 1926 and was commissioned in the Manchesters, a storied regiment with battle honors dating back to the 18th century. The regiment had been raised as the 63rd and 96th Regiments of Foot and had shed their blood for Britain all across the world. Forty-two battalions of Manchesters served in World War I  alone. 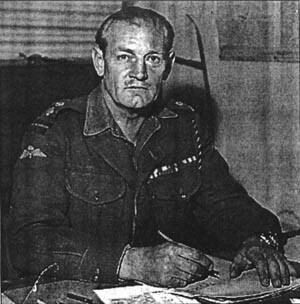 Jack Churchill’s younger brother, Tom, also became a Manchesters officer, and in time would rise to major general, retiring in 1962. His younger brother, called Buster, opted for the Royal Navy’s Fleet Air Arm and died for his country off Malta during the fierce fighting of Operation Pedestal . That Churchill was a free spirit was obvious from the beginning of his service, even in an army rich in such men. For example, while serving in Burma before the outbreak of World War II , he attended a course in signals at Poona in India. It might appear odd to some that Churchill took his motorcycle all the way from Rangoon to Poona, but it did not seem at all remarkable, at least to Churchill, to return the 1,500 miles from Poona to Calcutta—whence he was to take a ship for Rangoon—riding his bike. Along the way he lost a contest with a large and hostile water buffalo but returned to his unit in time to serve in the Burma Rebellion of 1930-32. Patrolling a quiet stretch of France during the pre-blitz “sitzkrieg ” of late 1939 and early 1940 did not suit a man of Churchill’s warlike temperament. And so, along with a bevy of other free spirits, including the fabulous Mike Calvert, he volunteered for the force assembling to help the Finnish Army, then under attack by the Soviet Red Army. That expedition was canceled before it could leave for Finland, and Churchill returned to the Manchesters in time to meet the German juggernaut as it crashed into Holland, Belgium, and France in May 1940. By that time, Churchill was second in command of an infantry company in the regiment’s second battalion. Churchill made it to Dunkirk , allegedly by bicycle, his bow and arrows hanging from the frame. From that terrible beach he was lifted back to England—so was his Manchester friend—courtesy of the gallantry of the Royal Navy and a horde of civilian boats and ships, and it was there he heard of a new organization being formed. It sounded like precisely the sort of outfit Churchill was cut out for. Requests for volunteers for this new duty were somewhat vague, but they promised aggressive service at least, and that was good enough for Churchill. Whatever a commando was, he would be one.